Well, when you build … I'm going to focus on the reputation portion of this. Signing up new reps, signing up new distributors because building a sales funnel for recruiting purposes is a little bit different than for customer purposes. A simple way to do this would be to create a sales funnel where you offer a new person either a lead magnet that's free, or something like an eBook, or a video series to get them into your funnel. That first page is going to be what's called a squeeze page. The first product would be a tripwire product. When you build your recruiting, your network marketing recruiting funnel you're going to build first an opt in page. Your first page would be an opt in page. You would design an opt in page with something that would attract your primary target. Now, your primary target can either be network marketers that are looking for a home, or it could be people who are looking for a home business. One of the two, but they're two different targets. When you create your opt in you're going to have to keep that in mind. A network marketer looking for a home would be more interested in things like lead magnets, or eBooks, or video series on how to generate more leads, how to handle objections, and how to get duplication in your down line, how to ensure most of your distributors stay on auto-ship, how to help your distributors find four new customers for the next seven days. Things like that are going to attract network marketers who are in the industry already because they know what that verbiage, they know what that stuff means. That's going to be important to them. Understand the biggest … One of the biggest problems in the industry is a grow lack of systematic training. Training is broken by far and large throughout the industry, so when you can provide proof that the training you have your hands on, the systems, the things that you have your hands on can solve those problems that a network marketer who was in another company is more than likely to listen to you be open to looking at your business, and your team because what you're really selling them is the privilege of being on your team. The reason your team is doing things differently than everybody else because let's face it, they can go find another team in your company, right? They can go to find any other topic earner, any other rep in your company and join them instead. You have to incentivize them to want to look at you, and really consider you. Otherwise, you're going to lose them to somebody else. In your funnel, when you're talking network marketers that are looking for a home, you're going to want to do four things. I'm sorry, two things. You're going to want, after you give them the lead magnet, you're going to want to send them a video that explains your company, the comp plan, why the company is really, really the place that they should be. The video that comes after the lead magnet should sell them on the company. Then the third video in the sales funnel should sell the on your team. If the funnel is designed to get them signed up in your down line, and not sell them an information product, or sell the same other product then you're going to want to move them to a second page, which is an educational page that teaches them about your company, your network marketing company. When they move from that page to the page after, the video should sell them on your team. A great way to sell them on your team is to cut a video with the top earners on your team. Get with the leaders on your team and do a video. Some sort of video that says, “Hey.” For example, in our previous company our team was called the Infinity team. That sells the network marketer. Then after that third page, you need to schedule a follow up with them. You can have some sort of link on that page, button on that page that gets them to say, “I'm ready for a follow up.” Maybe it's even a call to action that has them text a word to a number, so you can do like SMS texting after they've been through all those videos. At the end of your last video have them text a word like ready or something to a five digit number that gives you a notification, my cell that they watched the videos, and they're ready to be called. That is an efficient way of doing follow ups because now you can call them, and you are sure that they've went through all the videos, and they either have questions, or maybe an objection. But when you create a call to action in that third video that helps a person that's going through your recruiting funnel, your MLM recruiting funnel system helps them decide to take the next step. The call to action guides them on that path. Opt in page with a lead magnet like maybe how to handle the 15 most common objections in network marketing like a pro, or like a seasoned pro. An eBook like that would do really well. It would get them into your funnel. Video two, “Here's the company we chose, and here's why we chose it. If you're looking as a network marketer stay on page, watch this video, and we're confident that you're going to see why this company is poised to do great things in the industry.” They go through that video, button appears, click here for the next video to learn more about our team, the Infinity team. They click, they go to the third video, and it's you and the leaders in that video teaching them about your team. Then after they finished that video, and they're sold on your team maybe a button appears that says “Text READY to 41242, and one of our leaders will call you as soon as possible,” or something to that effect. Then as soon as you get a notification, boom. You call them, and then you do your enrollment, you do your follow up, however you're trained to do it. That is what I recommend you do in an MLM recruiting funnel. It'll get you great results. If you follow that little process there. Obviously, you can mix other things in like one time offers, or down sells. If they try to leave your page in the middle somewhere of the video like if they don't like the company, you can try to sell them an info product with a new page in that funnel. There's a number of things you can do there to test. Understand you should always be testing. It means create a variation of the original page, and then pick the one, change one variable in between those pages, and then pick the one that's better performing. 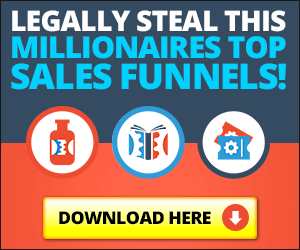 I highly recommend click funnels for MLM. There should be a link somewhere on this page. It's an affiliate link. You can sign up with click funnels, and by the way our team will give you coaching on that. If you need some help they have a great customer service portal inside the platform. They have a 14 day free trial. We use it in our company for non-network marketing clients, small businesses. We have over 500 small business clients. And, we use it religiously with them because most companies want their websites built on WordPress and it integrates with that. That's how you build, that's how we build MLM recruiting funnels when we were building actively in the field building an organization. Reach out to me on Facebook. My handle is Facebook.com/JasonLeeHQ. Hopefully that helps you. I hope you got value out of this. Share it on social media if you did.